Bali, Indonesia. Where food has thankfully taken us. 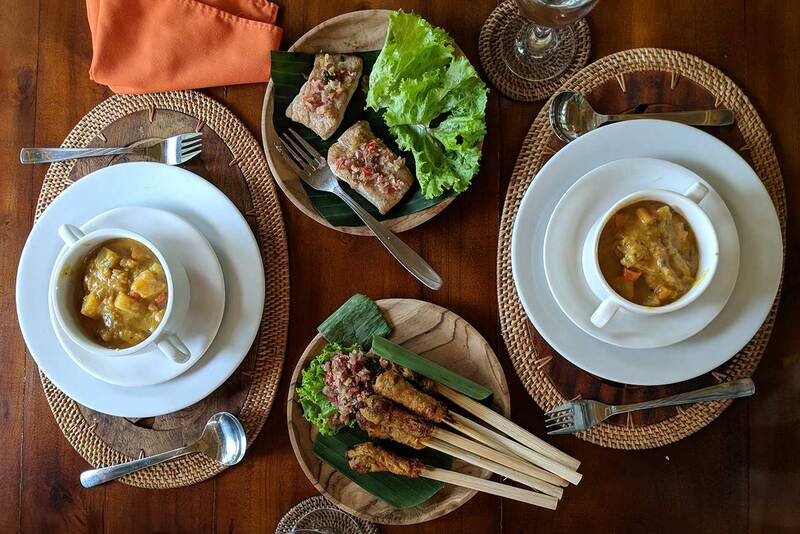 We got a real good taste of some real good food while in Ubud. 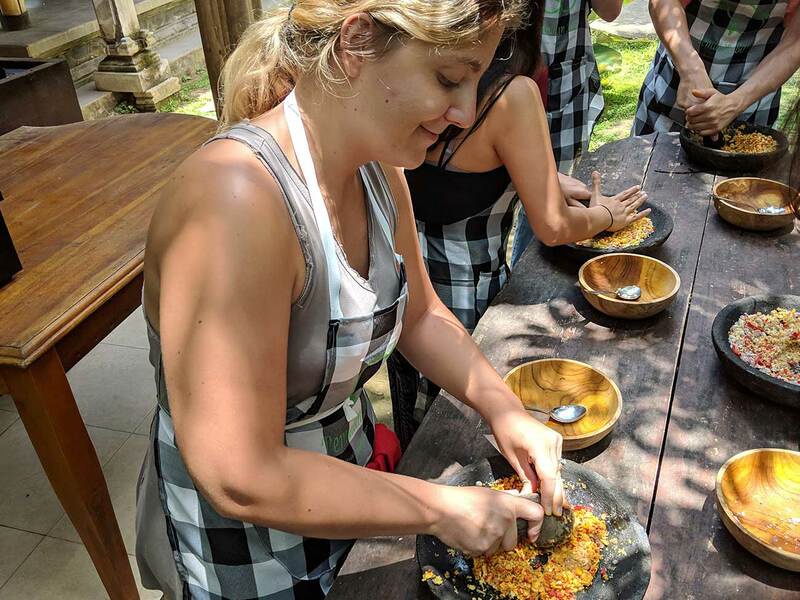 One of the many Airbnb experiences offered in the area, this Bali cooking class was cheap, informational, and lots of fun. 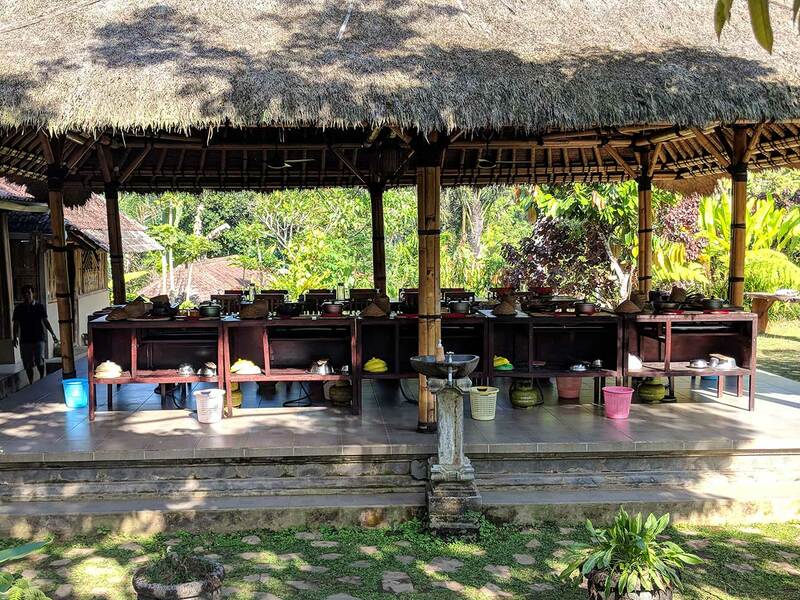 Our experience consisted of a visit to the local market near Ubud, learning about some organic farming and harvesting our own veggies, and finally cooking a delicious 5 course meal. 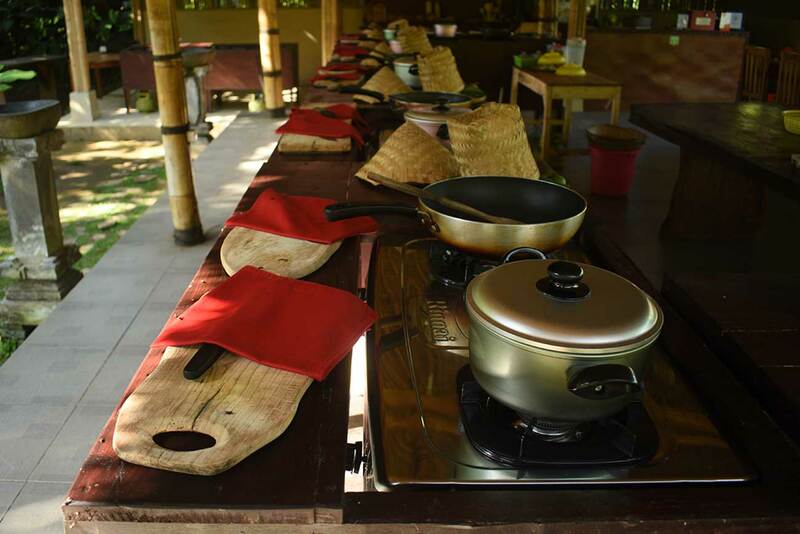 This cooking class is one of our favorite experiences in Bali thus far and one that you should definitely check out if you ever find yourself in this cheap and friendly paradise. 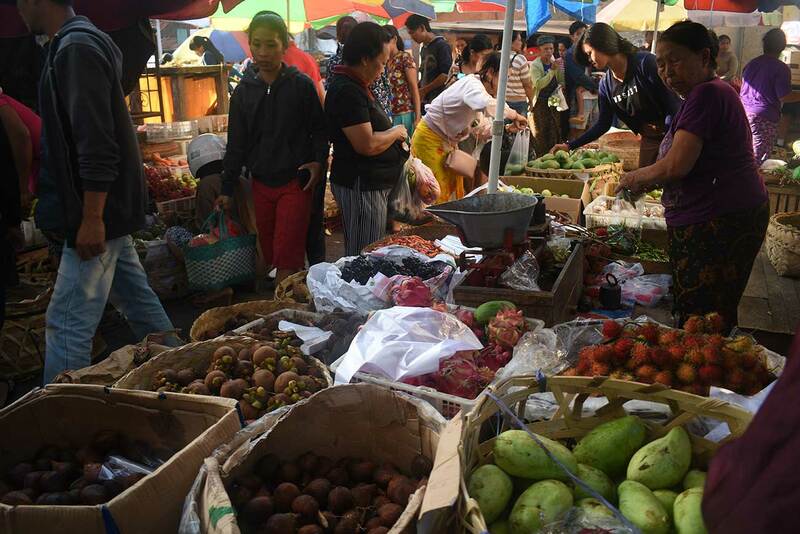 The market took place in the morning and it was chaotic to say the least. We had to slip by women carrying baskets on their heads while also toting goods in their hands. We tried to not get in the way of other locals as we sort of stared and soaked it all in. Our guide led us to several different fruit stands, which he talked about and let us sample. It was some of the most sugary fruit we’ve tasted. 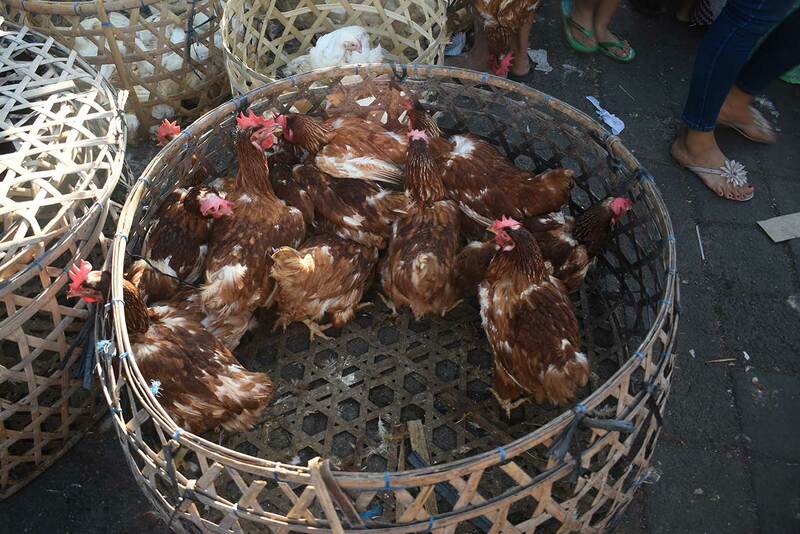 Besides fruits and vegetables, there were also live chickens being sold. It wasn’t the prettiest sight, as we saw chickens tied to the backs of scooters, but it is part of these locals’ life. 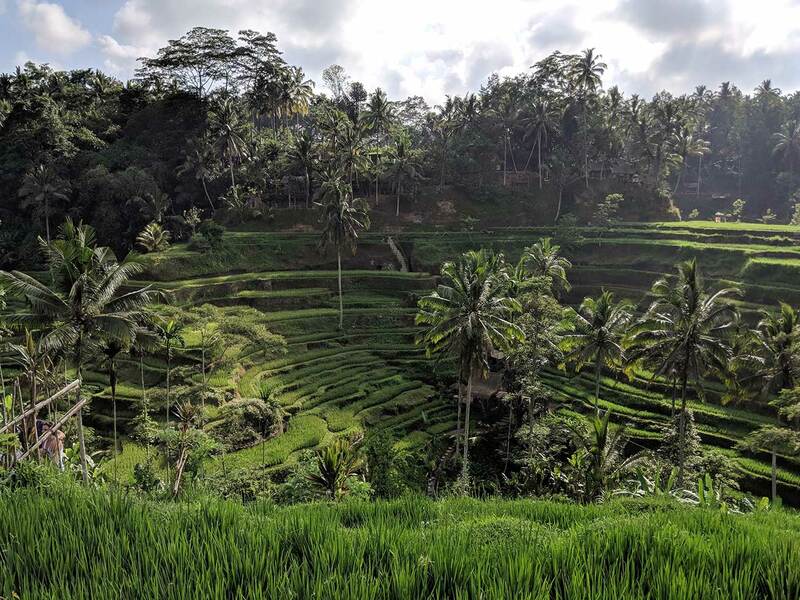 After the local market we made a quick stop at some beautiful rice terraces before heading to the farm to begin our Bali cooking class. After passing through a small village and dodging many potholes, we arrived at Pemulan Bali Farm. 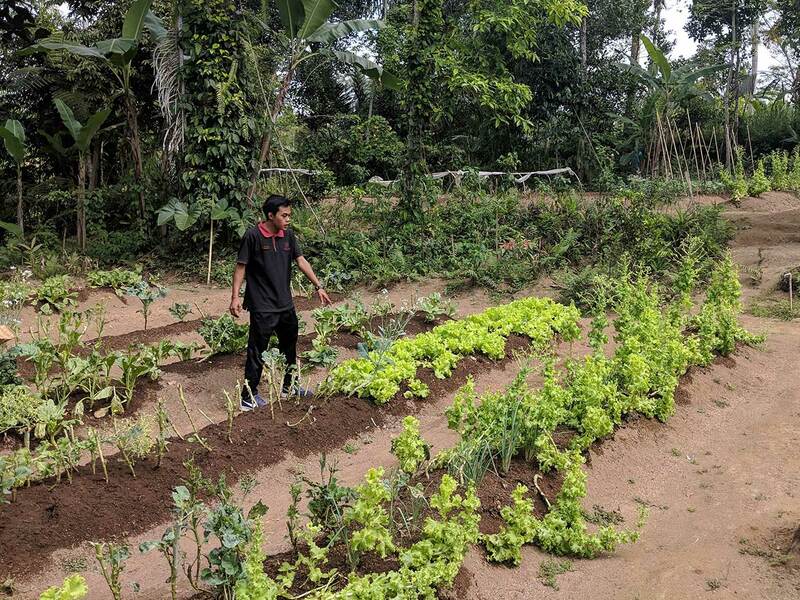 This farm is an organic farm, which we can really appreciate as we were trying to start our own little organic garden before we hit the road to Asia. Our compost is currently being cared for and we are anxious to return to it one day. Our guide took us on a walk through their farm, which housed tons and tons of vegetables, herbs, and fruits. 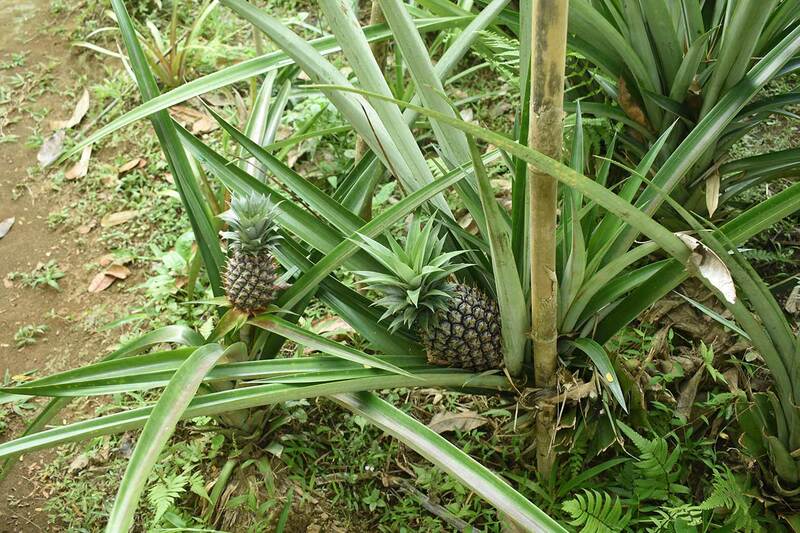 From Tumeric to pineapple to ginger to palm sugar to corn, this farm had everything. We filled our baskets with certain vegetation as our guide explained to us how it grew and how we would cook with it. There were also some unique Balinese spices and vegetables, which our guide provided alternatives for when we’re back home. Because, yes, we received a cookbook and we plan on making all of this again! It was a small group, about 15 of us, ranging from Americans, Australians, Germans, Britons, and Taiwanese. Each group had their own gas cooking range and cookware, as well as their own apron, which we got to keep! 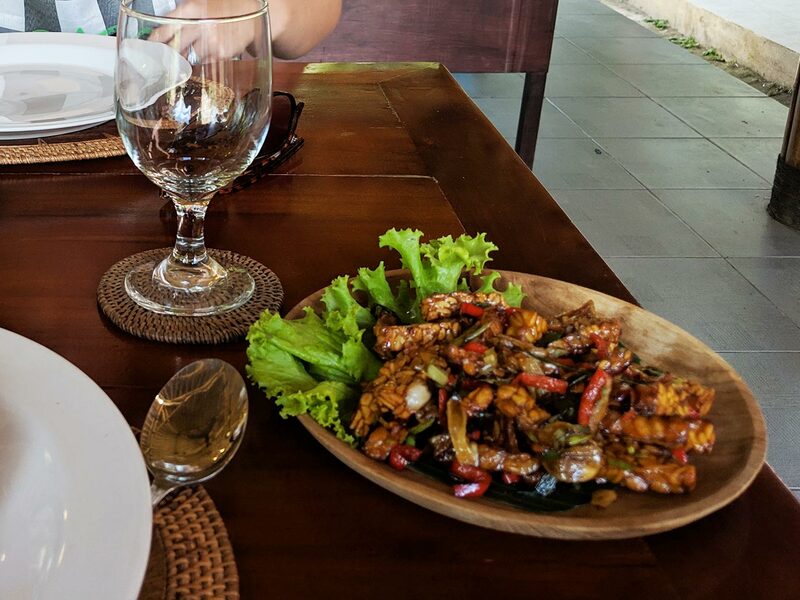 Our first meal was sweet and sour tempe and sayur urab (mixed vegetables). Tempe is a block of fermented soybeans similar to tofu. 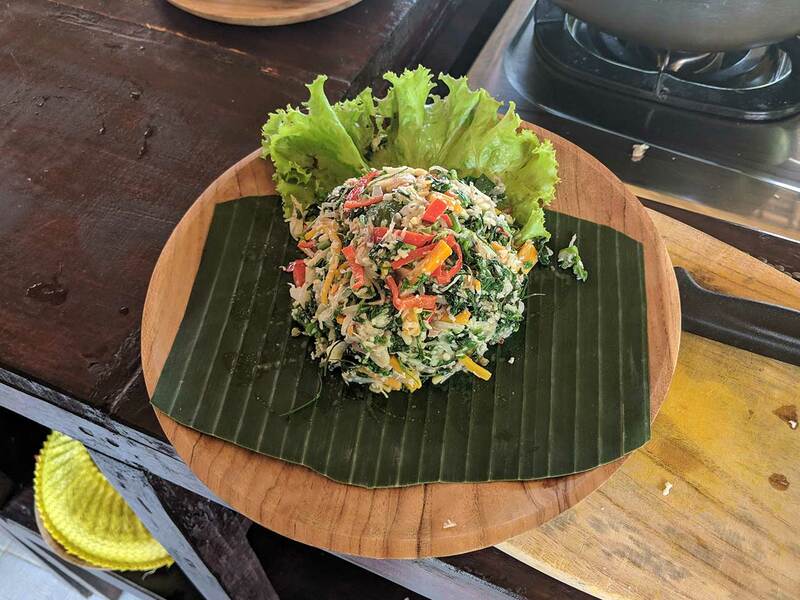 Sayur urab is a mixture of hard and soft vegetables cooked to perfection and seasoned with shallots, garlic, chilies, shrimp paste, lime, pepper and salt. This starter was amazing and more than enough food for two people. And we still had three dishes to prepare and eat! Our favorite part of Balinese cooking was the garlic, used in almost every dish. We would mince or slice garlic almost every night back in the States so this was a welcome ingredient to us. For the next course, we started by making a sauce called bumbubali. This Balinese ingredient has turmeric, ginger, shallots, garlic, chilies, ginger, shrimp paste, salam leaves (bay leaves) and lemongrass. Once we had all the ingredients finely chopped we put them all in a stone bowl and used a mortar to turn them into a savory paste. Bumbubali went into the creamy chicken curry and was the seasoning for our pork sate (ground pork on a stick). Our final dish was tuna steak seared on a pan and topped with sambal matah, which we would compare to salsa. Sambal matah includes shallots, chilies, lemongrass, shrimp paste, ginger, salt, pepper, and lime. For dessert, our host prepared black rice pudding with sliced bananas! This sweet dish was the perfect way to end a meal that touched all of our taste buds. 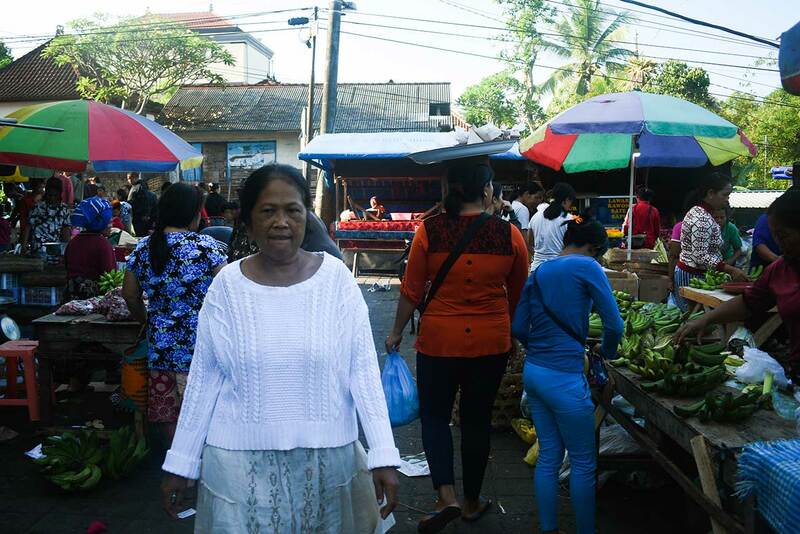 Cooking aside, this experience was great just to be able to meet people from around the world and to get to know some Balinese who had a wonderful sense of humor. 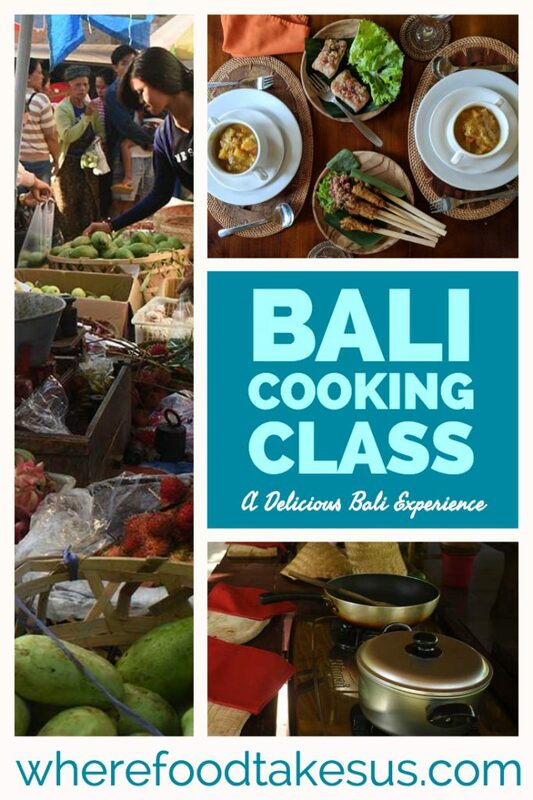 This Bali cooking class was far from dull and we highly recommend it! 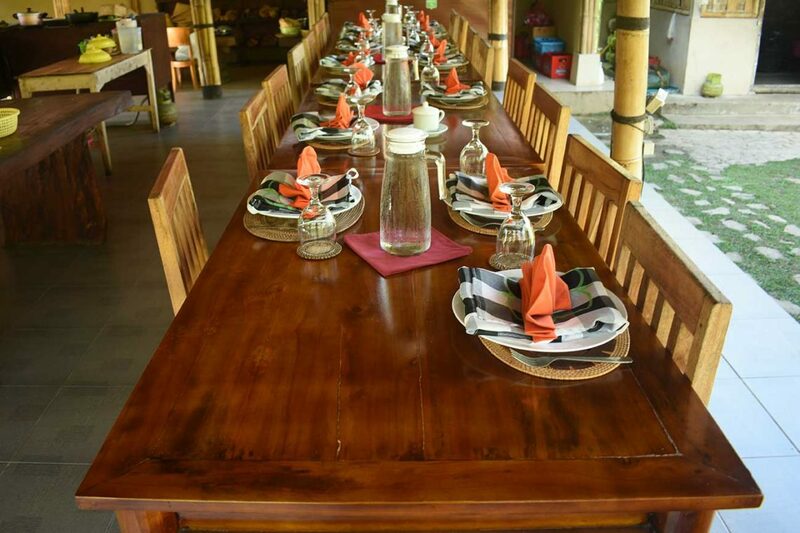 We booked this through Airbnb Experiences for only $28 USD each, but you can read more about Pemulan Bali Farm here!